Hemp seeds contain Omega-6 and Omega-3 fatty acids, two essential nutrients for growth, development, heart function and brain function. 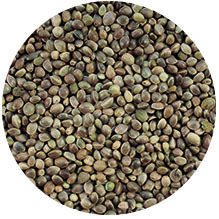 Approximately 44% of the weight of hempseed is edible oils (essential fatty acids). Proteins are the other major component. Hempseeds amino acid profile is close to “complete” when it is compared to other common sources of proteins such as meat, milk, eggs and soy. Hemp protein contains all 21 known amino acids, that adult bodies cannot produce. Hemp seeds can be eaten raw, ground into a meal, made into hemp milk (akin to soymilk), prepared as tea, and used in baking. In cereals, waffles, hemp milk ice cream, hemp tofu. Bakery products and nut butters. Hemp protein powder is a good vegan source of protein for athletes and body builders.